As we prepare to dive head-first into 2016, we wanted to first take a moment to highlight a shift in our terminology over the past year or so. Followers of this blog, or Sisense in general, may have noticed that we are talking less about Big Data, and focusing more on what we believe is the next big challenge in business analytics: the world of complex data. This post will explain why. Let’s start by saying that we don’t believe that Big Data is in ‘anyway’ over, or no longer a relevant concern for BI professionals? Actually, it’s the other way around: we’ve realized that big data is only part of a larger story, namely data complexity. We’ve always believed that data analytics software is meant to give companies more than a nicer array of data visualizations. A line chart stays a line chart regardless of how sleekly it’s drawn, and better graphics alone don’t translate into more value for BI users. The true power of analytics tools is in their ability to make sense of the more difficult datasets – to derive insights and actual, actionable value from the type of heavy-duty data that can’t reasonably be analyzed in spreadsheets. And while it might have been easy to describe this type of data using the all-encompassing buzzword ‘Big Data’, we believe that complex data is a more accurate description. We’ve covered the issue of what makes data complex extensively, and the bottom line is that it’s not merely the size of the data – either in terms of physical space occupied on servers, or in the number of rows and columns – it is also the diversity and disparity of the relevant data sources. 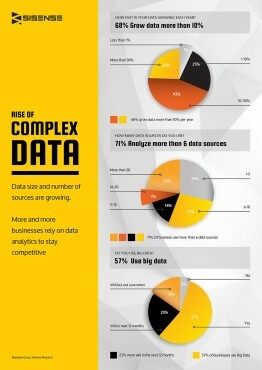 Data complexity is equally influenced by both the size of the data and its disparity. Each poses unique challenges in terms of data preparation and modeling, the possibility for effective, agile analysis, and the need to ensure high performance and availability. At the onset of 2016, it’s clear that in addition to amassing larger amounts of data, organizations are also coming to terms with a rapid rise in the amount of data sources they want to analyze: research by the Aberdeen Group shows that the average analytical user deals with 30 unique data sources on a regular basis; another study by Ventana Research found that most organizations need to combine at least six different data sources for analytical purposes, Advancements in technologies such as IoT, centralized logging and web data extraction will surely accelerate this trend in 2016 and beyond. That’s why big data is only part of the picture. It’s imperative for business intelligence systems to be capable of processing huge quantities of data, simply because yesterday’s huge is becoming today’s standard or minimum; but it’s also crucial for these softwares to provide a solution to the problem of data disparity – to be able to connect multiple sources and transform them into a single version of truth, underlying a robust, coherent analytical system. Hence – big data is out, complex data is in. While we usually don’t use this space for self-promotion, simplifying complex data is what we do better than anyone in the market today: we give organizations dealing with big and disparate datasets an analytical solution that is both simple and complete for effective data preparation, analysis and visualization. Early in the 21st century, when Sisense was still more of an idea than a product, it was already built on a technological foundation that makes complex data analytics dramatically simpler. This is In-Chip technology – a smart, efficient way to process large amounts of data, giving end users the ability to easily join tables from disparate sources, crunch terabyte-scale data, and do so without the need to remodel data or create indexes or aggregations. That’s why we believe that Sisense is the perfect solution for imperfect, complex data. Happily, we’ve received more than our fair share of validation during the past year: analyst recognition from renowned groups such as Ventana Research and Frost & Sullivan, being named to Deloitte’s Technology Fast 50 list, partnering with many exciting new clients while continuing to double our growth, and of course – securing $50 million in new funding. There are dozens of BI solutions out there, and certainly they all have their strengths and weaknesses. But we know that there is no other tool which can provide the same agility, flexibility and simplicity for organizations that are struggling to make sense of complex data. Indeed – big data analytics has become a sub-section of many different stories, not the story in itself. Big Data analytics is turning into the next major challenge and opportunity: giving companies the tools they need to effectively analyze complex data. This is what Sisense does best; and this is what we will continue to do in 2016 and beyond.